A third color variant is now available for the OnePlus 5. The new "Soft Gold" model is a limited-edition handset that features the same specs and price as the black and gray versions of the device. There is also a new Slate Gray model with increased memory. Have you been wanting to get your hands on a OnePlus 5, but stopped short of buying one because of the limited color choices? Black and gray—not everyone likes their phones looking so "neutral." Luckily for you, there is now a Soft Gold model of the recently-released phone, and it features the same specs and price tag as its less flamboyant siblings. As with the standard Slate Gray and Midnight Black models, the Soft Gold edition of the handset comes with 6 GB of RAM and 64 GB of internal storage. The Slate Gray OnePlus 5 now comes in an 8 GB RAM/128 GB storage variant as well, joining the Midnight Black model. Unfortunately, if you go the Soft Gold route you are limited to the lower memory specs. 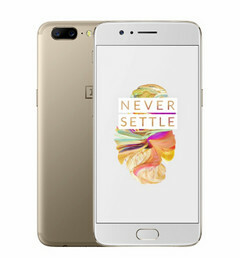 The new Soft Gold model is available from the OnePlus website for US $479. It is available in limited quantities and for a short time only, so get one while it's still in stock. A Slate Gray with the bumped-up specs goes for a bit higher, at US $539. Strangely, it is not listed on OnePlus' site as of now, but expect it to be up shortly.